Pope Benedict XVI celebrated Christmas Midnight Mass in the splendor of St. Peter's Basilica early Monday with an appeal for abused children around the world, including child soldiers, beggars and others deprived of sustenance and love. "The child of Bethlehem directs our gaze toward all children who suffer and are abused in the world, the born and the unborn," Benedict said in his homily, referring to the church's stand against abortion. In celebrating Jesus' birth, he said people should direct their thoughts toward children forced to serve "as soldiers in a violent world, toward children who have to beg, toward children who suffer deprivation and hunger, toward children who are unloved. 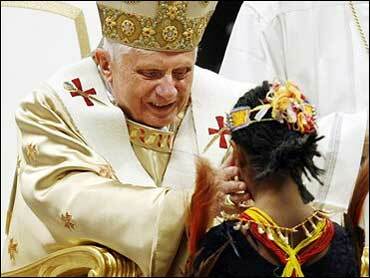 "Let us pray this night that the brightness of God's love may enfold all these children," the pontiff said. "Let us ask God to help us do our part so that the dignity of children may be respected." Earlier, the pope used his weekly Sunday blessing to ask the world to overcome prejudice, while some Christians celebrated amid heightened security due to the threat of terror attacks. Peace on earth seemed a distant dream this Christmas. Police guarded churches in Pakistan and Indonesia, and in Bethlehem, there were no Christmas carols this year. Queen Elizabeth II sent a special Christmas message to British troops overseas, telling them "your courage and loyalty are not lightly taken" amid mounting losses in Iraq and Afghanistan. To symbolize the worldwide reach of the Roman Catholic Church, children in native costumes from around the world -- including Korea, Poland and Burkina Faso -- brought flowers to a figure of the Baby Jesus near the altar. Benedict told worshippers to "not forget the true gift: to give each others something of ourselves, to give each other something of our time, to open our time to God." Christmas gift-giving also means giving to those who cannot give anything back, he said. "This is what God has done," the pontiff said. Twelve hours after the solemn ceremony, the 79-year-old Benedict was scheduled to deliver the traditional "Urbi et Orbi" speech — Latin for "to the city and to the world" — to a crowd expected to number in the tens of thousands in St. Peter's Square. His predecessor, Pope John Paul II, used this traditional Christmas Day message to review progress and setbacks for humanity. Wearing gold-colored vestments, smiling at the faithful and raising a hand in blessing, Benedict strode up the main aisle to take his place on the central altar, which was decorated with red poinsettia flowers. He walked around the altar, sprinkling incense. Earlier, Benedict delivered his weekly Sunday blessing to a crowd of pilgrims and tourists gathering in St. Peter's Square, waiting for midnight Mass. Speaking from a window overlooking the square, the pope said people should strive to "overcome preconceived ideas and prejudices, tear down barriers and eliminate contrasts that divide or worse — set individuals and peoples against each other, so as to build together a world of justice and peace." Those barriers loomed large in the predominantly Muslim countries of Pakistan and Indonesia, where minority Christians attended church under tight security. There are 31 churches in and around Pakistan's capital, Islamabad, and "we have given security cover to all of them," said Sikandar Hayat, a senior police officer. Church officials said metal detectors were set up for most services and armed guards watched over worshippers. Authorities were taking no chances: two assailants used a grenade to kill three girls at a tiny Protestant village church in 2002. "I visited Liberty market last night to buy some gifts," said Masroor Raza, 19, a student at Forman Christian College in the eastern Pakistani city of Lahore. "I completed my shopping at earliest and hurried away from the market. You know the security reasons; it's Christmas Eve." In Jakarta, Indonesian police checked worshippers and searched for bombs at churches after warnings by Western nations that Islamic militants might be plotting Christmas attacks. Indonesian officials played down the alerts, common since Christmas Eve bombings across the country killed 19 people in 2000. Still, 18,000 officers were deployed at churches as a precaution, police spokesman Col. I Ketut Untung Yoga Ana said. Most of the crowd gathered in Bethlehem's Manger Square were local Palestinians with a sprinkling of foreigners. The Islamic militant group Hamas now controls the Palestinian government, and some Christians worried about open celebrations. Latin Patriarch Michel Sabbah celebrated Midnight Mass at the Church of the Nativity, above the grotto where tradition says Jesus Christ was born, reports CBS News correspondent Robert Berger. Sabbah, who is a Palestinian, appealed to Israeli and Palestinian leaders to end the bloodshed. There were fewer Christmas decorations in Bethlehem than in the past. For the first time, no Christmas carols were broadcast over a loudspeaker system. "After the Taliban, we started to make Christmas trees because lots of foreigners are around, and they are asking for them," said Eidy Mohammad, owner of the Morsal Flower Store. "Business is growing — we had only the wedding season before, but now we have Christmas as well." He said he had sold about a dozen Christmas trees, earning anywhere from $20 to $200 — a hefty sum for Afghans, many of whom make only about $50 a month. Money was short supply this Christmas in the southern African nation of Zimbabwe, where the worst economic crisis since independence has led to shortages of everything from consumer goods to electricity. Many shops and factories have not been able to pay traditional holiday bonuses to their employees.